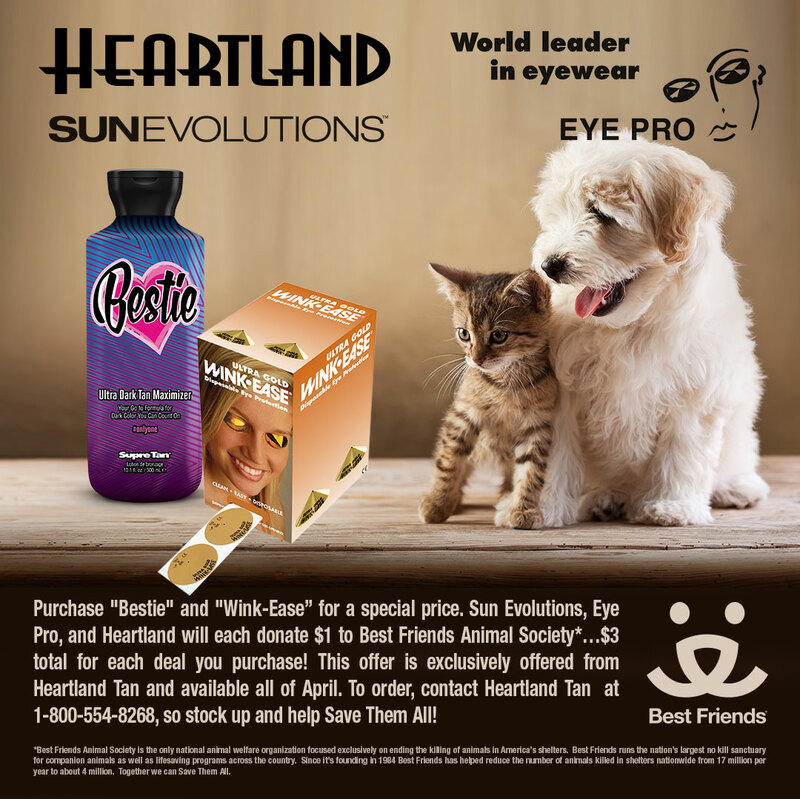 Press Release | Eye Pro, Inc.
Sun Evolutions, Heartland Tan and Eye Pro Support Best Friends Animal Rescue! April 2017 – Sun Evolutions, Heartland Tan and Eye Pro have teamed up in April to raise funds for Best Friends Animal Society, to prevent 9,000 dogs and cats from being killed daily in shelters. 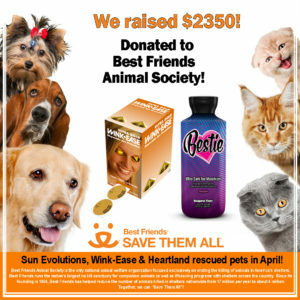 During April, $3 will be donated to Best Friends Animal Society for every “Best Friends” deal purchased from Heartland Tan. The April deal includes a bottle of Bestie tanning lotion from Supre Tan and a box of Wink-Ease disposable eye protection. Here’s how you can help “Save Them All”! Try “Bestie”, Supre Tan’s ultra dark tan maximizer, to prepare your skin for its darkest tan! 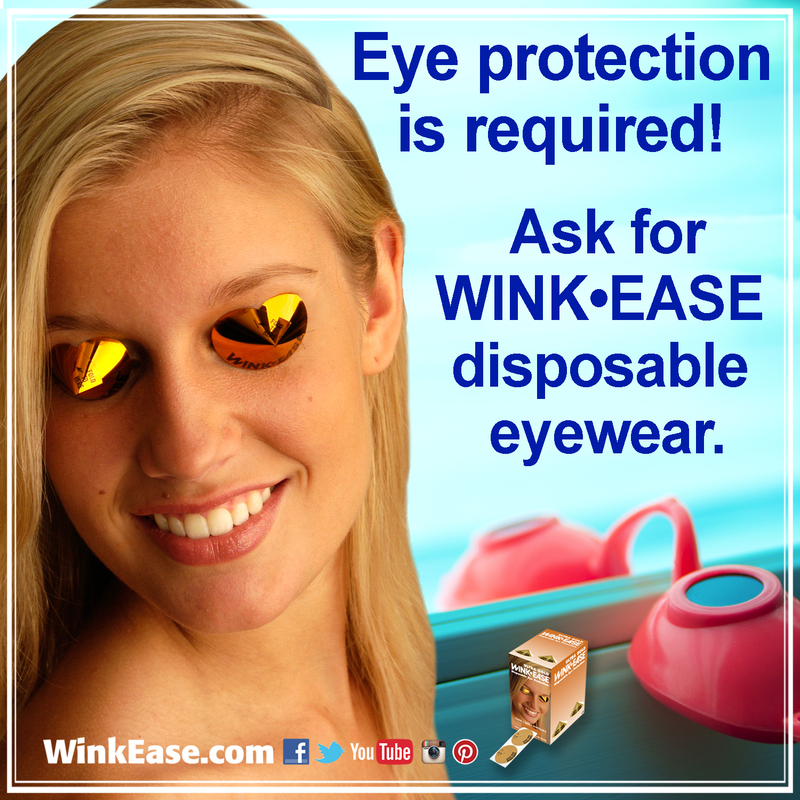 Ultra Gold Wink-Ease disposable eye protection is the world leader in clean eyewear! When you purchase both “Bestie” and “Wink-Ease”, Sun Evolutions will donate $1, Eye Pro will donate $1 and Heartland will donate $1 — $3 total for each deal you purchase! This offer is exclusively offered from Heartland Tan and available the entire month of April. And the best part is that “Bestie” tan maximizer and Ultra Gold Wink-Ease roll of 250 pair are just $40! Salons save $25 on this awesome deal and $3 is donated to the “Best Friends Animal Society”! To order, contact Heartland Tan at 1-800-554-8268, so stock up, help your furry friends and together, let’s “Save Them All”! 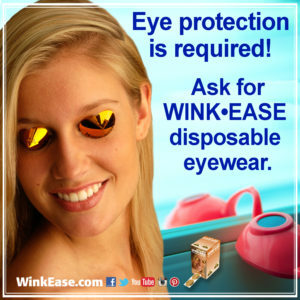 For more information on Ultra Gold WINK-EASE, Lash Room WINK-EASE or WINK-EASE Dark, visit WinkEase.com or contact EYE PRO at 1-800-726-8322. Follow and “like” WINK-EASE on Facebook, Twitter, You Tube, Instagram and Pinterest to learn about special salon offers and promotions. For more information on all Sun Evolutions tanning products, visit SunEvolutions.com. For more information on Best Friends Animal Rescue, visit BestFriends.org. Posted in For Salon Owners, Press Release | Comments Off on Sun Evolutions, Heartland Tan and Eye Pro Support Best Friends Animal Rescue! FREE Window Cling from WINK-EASE! 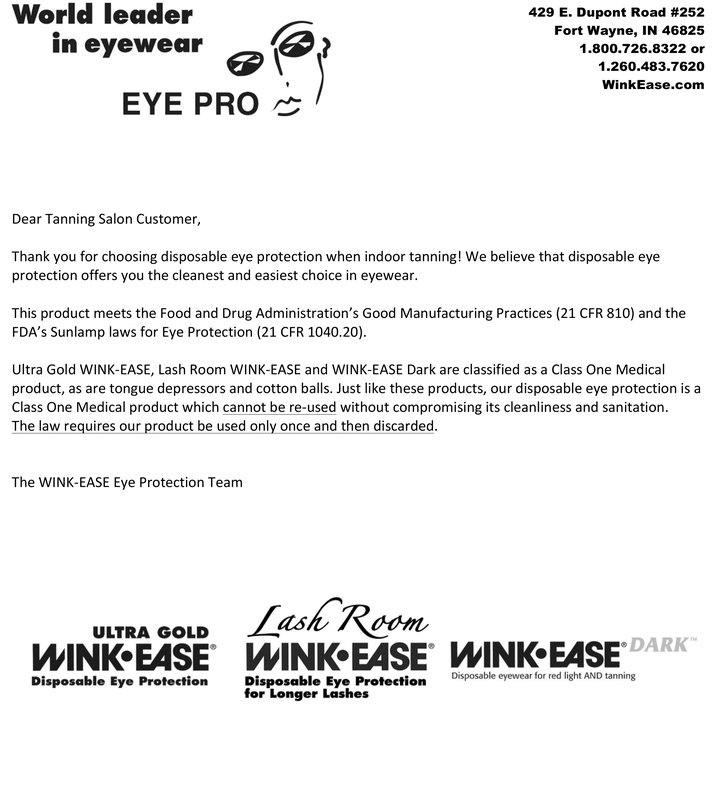 March 2017 – EYE PRO, Inc., world leader in eyewear and makers of Ultra Gold WINK-EASE, Lash Room WINK-EASE and WINK-EASE Dark, is offering salons a FREE WINK-EASE window cling. Posted in For Salon Owners, Press Release | Comments Off on FREE Window Cling from WINK-EASE! 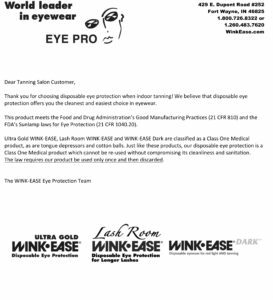 February 2017 – EYE PRO, Inc., world leader in disposable eye protection for indoor tanning and makers of Ultra Gold WINK-EASE, Lash Room WINK-EASE and WINK-EASE Dark, is all about providing salon support. Come See EYE PRO and get a FREE Window Cling! January 2017 – EYE PRO, Inc., world leader in eyewear and makers of Ultra Gold WINK-EASE, Lash Room WINK-EASE and WINK-EASE Dark, will be participating at several distributor expos this tanning season, and any salon who attends will receive EYE PRO’s new Window Cling. Posted in For Salon Owners, Press Release | Comments Off on Come See EYE PRO and get a FREE Window Cling! Expanded Pinterest Library Now Available for Salons! 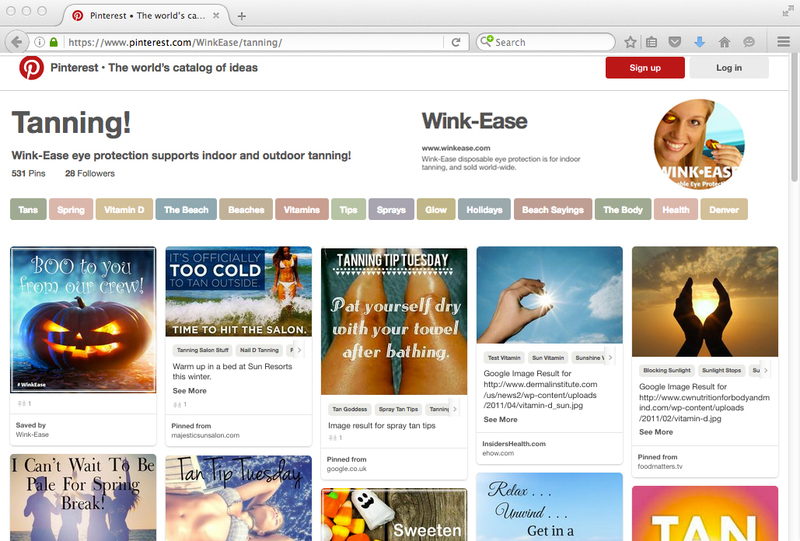 Eye Pro, Inc., world leader in eyewear and makers of Ultra Gold WINK-EASE, Lash Room WINK- EASE and WINK-EASE Dark, has loaded our Pinterest with over 500 tanning posts for you to share with tanners! Post to any other social media from Wink-Ease’s Pinterest library! Posted in For Salon Owners, Press Release | Comments Off on Expanded Pinterest Library Now Available for Salons! 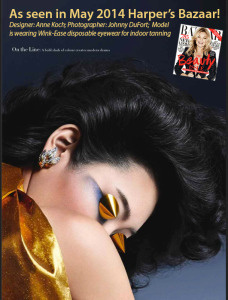 Ultra Gold Wink-Ease Hit the Fashion Industry! May 1, 2014 – EYE PRO, Inc., world leader in eyewear and makers of NEW Ultra Gold WINK-EASE, VIEWkeepers, Fresh-Ease and Wink-Ease Dark, is excited to announce that Ultra Gold Wink-Ease is making its fashion premiere in the May issue of Harper’s Bazaar. Posted in Press Release | Comments Off on Ultra Gold Wink-Ease Hit the Fashion Industry!